The Port of Lewiston's proposed fiscal 2016 budget could be deeply in the red. With $798,361 in proposed operational expenses - nearly 67 percent of it borne by taxpayers - the port has failed to consider the looming $1.3 million debt it could face if the U.S. Department of Transportation upholds a complaint filed by local residents and conservation groups. In September 2014, 10 Lewiston area residents and property owners along with conservation groups Friends of the Clearwater and Idaho Rivers United filed a complaint with the Department of Transportation reporting that the Port of Lewiston made false claims in its 2012 TIGER IV Discretionary Grant Application. Grant funds were used to extend the port's container dock. The parties petitioned DOT "to take ... enforcement, remedial or other action" in response to information detailed in a 32-page report accompanying the complaint. DOT is directing an inquiry into the matter and has advised that "potential administrative, civil, or other proceedings have not been ruled out." The petitioners are represented by attorney Natalie J. Havlina. 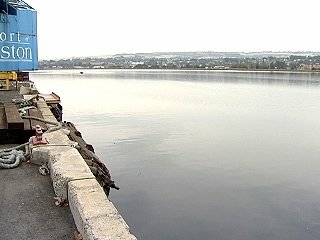 "Since the USDOT investigation could result in a demand for the Port of Lewiston to pay back the federal $1.3 million the port acquired via its grant application, we petitioners feel now is the appropriate time for the port commissioners, manager and auditor to address the ongoing investigation and potential budget-related result," said petitioner Dustin Aherin, a resident of Nez Perce County. The port commission will hold its FY 2016 budget hearing at noon Wednesday at the Port Administrative Building.